Be cautious of under capacity computers that don’t meet the specifications for Isuzu IDSS II. 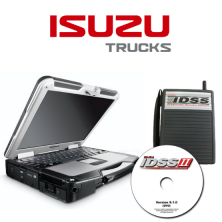 Our computer meets and exceeds the specifications for Isuzu IDSS. Location Chart of Fuse Panel, Relays, Connections, etc. **2005 & newer Isuzu truck wire harnesses are built with PTO installation in mind. All necessary plugs are located throughout the vehicle and are pre-connected to the ECM. This facilitates the installation & use of a PTO. The IDSS allows the technician to make PTO settings through the ECM. This allows for a clean, professional installation.